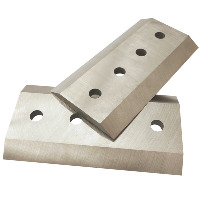 Welcome to Jorson & Carlson's new web site for chipper blades. We carry a large selection of wood chipper blades and understand that when you need blades, you need them now. "How much wood can a woodchuck chuck"? We really don't know, but you know how much wood you chip! Each chipper blade we sell is made to meet O.E.M. standards. This ensures that you receive the best possible results from our products. We have a team that offers many years’ experience in the industry and are able to provide you specific solutions for your wood chipping needs. In addition our selection of new chipper blades, we also sharpen. Our precision grinding insures minimal stock removal which is a huge plus and translates to longer life of the chipper blade overall. With our 5 US locations, we turn our grinding work "quick like a bunny". For pricing, inventory or general questions, contact Mike Powers; mpowers@jorsonandcarlson.com or call 800.656.7766. Below is a list of popular and common chipper knives.